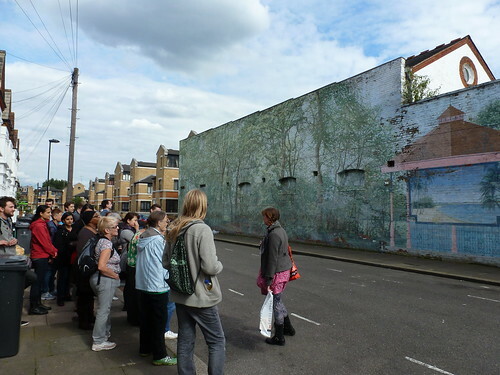 In February 2014, the fate of the Mauleverer Road Mural was sealed when it was decided at the planning appeal that the developers of the Mauleverer Road site could go ahead and remove one half of the mural. The retention of the locally listed artwork had been supported by Lambeth but at appeal level, the developers had a large team with a range of arguments that they could use against anything that the council or those attending the appeal could present as a reason to keep the mural. The LMPS attended the appeal as we felt it was important to support the retention of the mural. The beautifully executed mural shows four different scenes: a view of woodlands, a bandstand with a Caribbean scene, a walled garden and some horses; most of these subjects are connected to the area’s local history. Compared to some of London’s better known murals of the period such as Brixton’s Nuclear Dawn mural, it contains no political messages. However it is a good example of a Community Mural; these artworks tended to involve community participation often in the design development stages. Community Murals, which can be considered to be a separate artistic movement of the 1970s and 1980s, evolved from the practices of the Community Arts movement. For many community art workers, their job was to take art out to people, often in marginalised communities, to provide an opportunity for self-expression. There were varying degrees of input from local people, often dependent on the views of the artists leading the project. For those working on the Mauleverer Road Mural, ideas were provided by the local residents and the artist, Jane Gifford, created a design which was approved by the community. The wall was repaired by Jane with the assistance of Ruth Blench, Caroline Thorp and Mick Harrison before work could be started on the painting. Once the wall was in a good condition, come rain or shine, the painting began. The woodland area was perhaps the most complex to get right as it covered a large area. The design was divided into four parts, the artwork divided into a grid to correspond to grids drawn on the wall and the artists each worked on one section of the wall, square by square. As all artists have their own style of painting, they realised that if they each remained on just one section of the woodland scene, it would be obvious that there were four different artists painting the mural. To counteract this problem, they swapped the sections they were working on so that the layers of paint and brush strokes by the different muralists created a unified whole. The exceptional skills of these people as artists and muralists are identified by the quality of the finished work. The photograph below which pins together a series of photos shows the excellence of the artwork. Click it to get a closer view. When this work is finally demolished, not only will we lose an example of community arts but we lose one that is part of what has become known as the Brixton Murals. This group of paintings shows the work of eighteen muralists, mostly working as teams. It reveals different styles, approaches and contents and although many in the area are already gone, those remaining give a feel of what it must have been like to be surrounded by this type of artwork. Not only do these remaining murals tell us about art in the 1980s and the artists involved, they reveal stories about the local community, whether a reflection of the area’s general history or more specific requests for example, the wish of local people to see a picture of the River Effra in their neighbourhood. There is an increasing interest in the work of community artists but by the time this is more mainstream, it will be too late for the Mauleverer Road Mural. Do visit the mural before it goes. This entry was posted in London Mural Preservation Society, London Murals and tagged Brixton, Brixton Mural Walk, Caroline Thorp, Community Murals, Jane Gifford, London, Mick Harrison, murals, Ruth Blench. Bookmark the permalink.